The vacuum shredders from STIHL pick up immense volumes of fallen leaves, cut grass and trimmings and simultaneously shred them. Reduced to less than 10% of the original volume, the organic material can be used directly for composting or mulching. 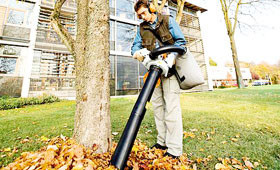 With the standard accessories you can turn the vacuum shredder into a powerful blower too.